Who we are Studio 63 is conceptualized as a space where ideas evolve and imaginations are given shape, quite literally. Ours, is a multifarious approach: BESPOKE CREATIONS Spaces are a combination of function, appearance and emotion. They are built by imagination, followed by the act of creation. We are a convergence of the two. We create what you imagine. Our customized services extend to designer bedspreads, curtains, wallpaper, posters, paintings and murals, among others. Who is it for? / Our Clients Everyone has ideas. But not all have the skill and ability to turn their ideas into reality. That’s where we step in. We are the ones who give shape to your imaginations and ideas. Our services for personalized home interior accessories enables you to tailor and craft your interior spaces the way you want. 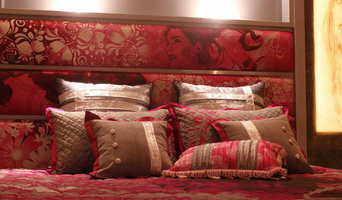 Designer bed sheets, curtains, wallpapers, posters, mural and paintings – we customize these for a diverse set of clients. The pool of clients at our retail store is ever increasing. Artists, designers, architects, art collectors, homemakers, students and corporates, we’re thrilled to see that our little store has something for everyone! Hi there! Let us know how we can work together or what can we do for you. 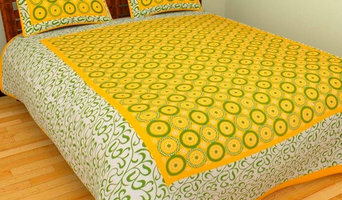 Bedcolors is a one stop shop where you get high-quality bed sheets for your sweet and elegant home. Inspiring rajasthani print bed sheets from the house of Bedcolors to give your home a personal meaning and fill nights with a comfortable & sound sleep, the cotton sheets are your real stress busters. Jaipur hand block print textiles. 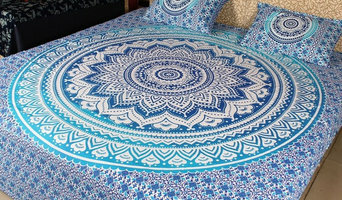 Manufacturers and exporters of designer collection of Home Furnishings and Textiles. Welcome to our page of RAJASTHAN FASHIONS. Our main aim of the establishment is to create an online platform where we can showcase our various Indian Handicrafts to buyers across the globe. RAJASTHAN FASHIONS Was founded to bring the opportunity for a better life to thousands of talented artisans by providing them a window to customers around the world. For centuries, these artisans have carefully preserved their skills, passing it down generations while living in abject poverty and neglect often ignored by the government and pushed into harsh living conditions while creating exceptional goods valued around the world. 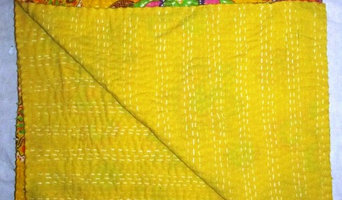 A Place of colorful screen and hand printed tapestry, bedding, tapestries, Mandala Tapestries, bedspreads, bedsheet, Kantha, quilts, coverlets, throws, wall hangings, cushion cover and pillow cover created using screens, hand blocks, patchwork, printing and embroidery techniques that have been passed down through generations. The colors and textures radiate from these breath-taking textiles which carry within them the storied tradition of our design. Our shop items are handmade and Authentically Made. Each and every item in our shop is handcrafted with passion. All fabrics are sourced for their quality and beautiful colors. 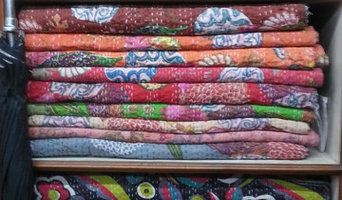 We offer a wide range of high quality colorful bedspreads and hand crafted wall hangings that are perfect for adding ethnic style to your home decor. Bed sheets, Tapestries, quilts and throws will imbue any room with cultural flair, filling in empty space with huge doses of color, patterns and textures. Smaller details like fluffy towels, plush bed sheets, smooth bed linens and soft furnishings are perfect to welcome your private space after a long day. These are not only functional but will also add texture to the room. Creating a bath retreat does not mean a brand-new bath tub, there is plenty you can do to refresh the space by making it more functional. Storage is always a problem, so think about creatively using bathroom furniture. Bathroom accessories manufacturers in Jaipur will be able to help you the best alternatives to bathroom cupboards, like ladder stands that are multi- functional yet stylish. Bathroom stands are a great way to display fluffy towels and other bathroom items. Creating a luxurious master bedroom won't be complete until you find the ideal bed sheet manufacturer in Jaipur. Talk to the professionals before picking bed linen, ask about the thread count and material. If you want softer than soft, go for high thread count cotton, like Egyptian cotton, instead of the gentle jersey cotton, but if you are after crisp and clean lines, white linen is the way to go. You can also opt for jewel toned bedding sets to ensure you create a perfectly royal look. Find bedding, towels and bathroom accessories professionals on Houzz. You can narrow down your search for textile designers, Jaipur bathroom showroom, and bathroom supplier by choosing Bedding & Bath’ supplier in the Find a Pro section. Find the most reviewed bed linen and towel manufacturers and check out photos for ideas.